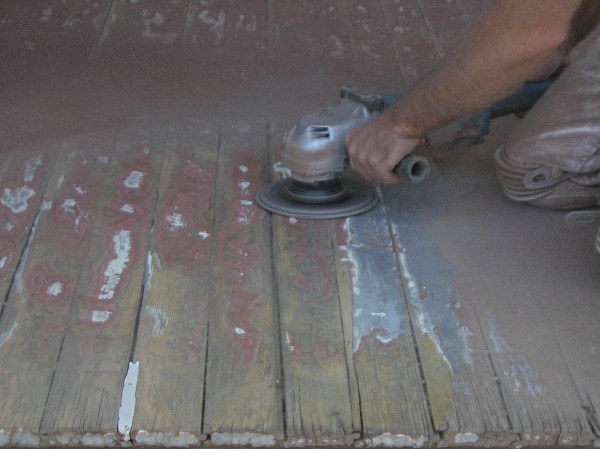 Using a finishing sander on a wood deck floor. For any deck refinishing job to look its best, you’ll need to sand the surface before refreshing the finish. Choosing the right sander for your deck refinishing job will make the difference between a job that looks like a professional did it, or one that looks like a homeowner tried to cut corners. There are several types of power sanders. Some are better suited to sanding decks that others. Let’s look at the pros and cons of the different sanders available. Palm and vibratory are the least likely to cause gouging or other damage, and are a good choice for amateurs. Because of their small size, however, the job can take a very long time. They can also cause cross-grain marks in the wood if too much pressure is applied. Consider using a palm sander for final finishing after using a disc or belt sander. Disc sanders and large angle grinders are Crowder Painting’s choice for most sanding jobs we encounter. We often use a coarse buffing pad to quickly remove the old finish. If this doesn’t work, we use sanding disks. The primary risk with these types of sanders is the speed at which you can damage the wood if used improperly. If you are inexperienced, you’ll either want to practice using a disk sander or angle grinder, or avoid this type of sander entirely. A good deck can be ruined rapidly if a disk sander gets out of your control. Belt sanders are best for the flat tops of railings. They can also be used on the deck floor, but they’re hard to control when used this way. Once again, practice is important before you decide to use a belt sander on the deck floor. On very large decks, you may be tempted to use the big sanders available at rental outlets. These use either drum sander or orbital sander designs. These are primarily used for refinishing hardwood floors, and, while they can work for decks, there are a couple important things to keep in mind. Because decks are exposed to snow, rain, wind, heat, and cold, they are prone to warping. Twisted or bowed boards are not easy to sand with a commercial floor sander. The sander takes off the high points but fails to sand the rest of the board. In addition, these large vibratory/orbital sanders are very heavy—often more than 100 pounds. This makes them hard to transport and haul up steps. On the upside, they are easy to use if the surface isn’t heavily cupped or warped. Drum sanders are not a good choice for amateurs. They remove a lot of wood very quickly and can cause severe damage to your deck. Avoid this option unless you’re an experienced user. New decks which haven’t been exposed to much weather and hardwood decks, which are less likely to warp than their softwood counterparts, are the best candidates for commercial power sanders. Our preference is the orbital sander because it’s so much easier to control when compared to a drum sander. If you do choose to use a large commercial sander, you’ll only be able to use it on the deck floor. You’ll still need a smaller tool for railings, benches, and planters. 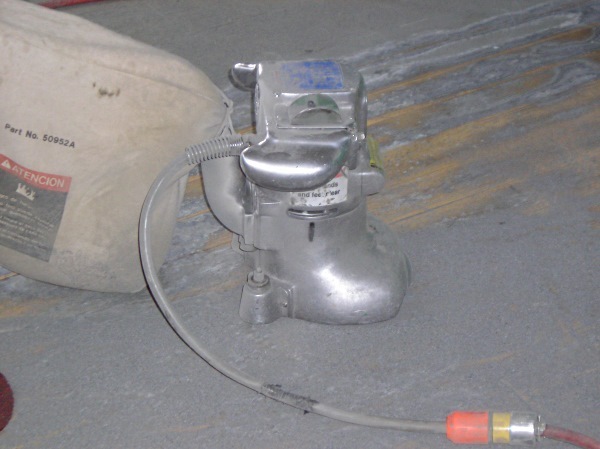 Floor edgers are lighter and smaller than the other two types of commercial sanders. They are designed primarily to work along the edge of the floor along a wall. 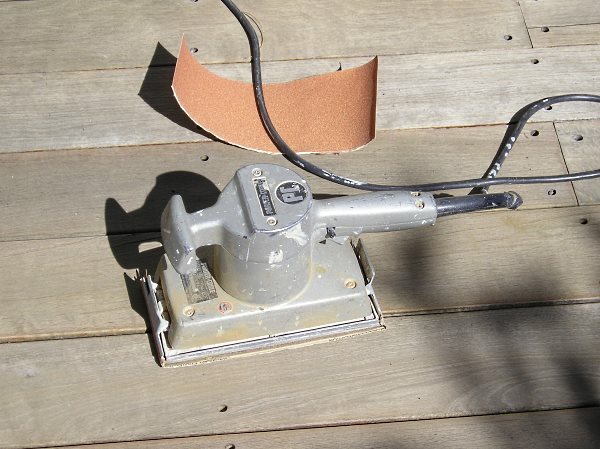 This type of sander is usually difficult to control on uneven deck surfaces. It’s possible to do a very professional sanding job with the sanders available to you at the hardware store. There’s no need to rent a commercial sander. You can achieve excellent results with rectangular vibratory/orbital sander.